F. Murray Abraham's bio in the "Who's Who." Jack Weston, Rita Moreno and Jerry Stiller claimed the above-the-title real estate for the McNally comedy, The Ritz, where a Cleveland man-on-the-run hides out unknowingly in a gay Manhattan bathhouse. Robert Drivas directs the production, which opens Jan. 20 at the Longacre Theatre. Adela Holzer produced the Broadway run of the work, which debuted at Yale Repertory Theatre. The title page in the The Ritz Playbill. In the Playbill, among advertisements for cars (the new Caprice Classic featuring "deep, cut-pile carpeting which extends up the lower door panels"), local eateries (MaBells and Joes Pier 52), airlines (Delta's "free steak & champagne" on nonstops to Florida), cigarettes and alcohol are plugs for Richard Chamberlain's turn in NBC-TV's "The Count of Monte Cristo" and the original cast recording of Mack & Mabel. 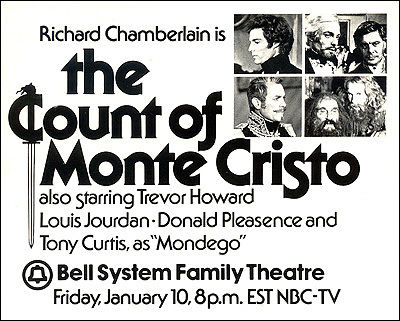 An ad for "The Count of Monte Cristo." An ad for the Mack & Mabel recording. Editorial featured in the Playbill includes a "Who is Maggie the Cat..." interview with Cat on a Hot Tin Roof star Elizabeth Ashley; "Test Your Theatre Memory" quiz; a Playbill Fashion Supplement (with a "Four Men on Broadway" feature about current stars Richard Kiley, Joe Morton, Keir Dullea and Jim Dale) and the signature "Who's Who in the Cast." 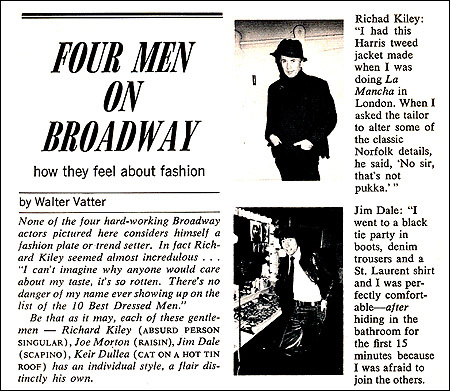 A portion of the "Four Men on Broadway" feature. 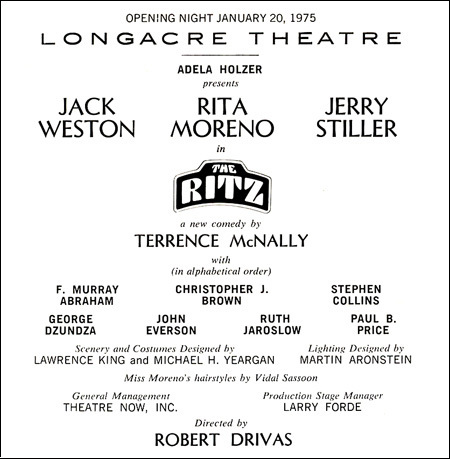 The Ritz would earn Rita Moreno a Tony Award and play 398 performances before closing Jan. 4, 1976. Moreno, along with co-stars Weston, Stiller and Abraham, would reprise their roles for McNally's 1976 screen adaptation directed by Richard Lester. According to Playbill Radio program director and Broadway Yearbook editor Robert Viagas, Moreno may have had a hand in changing Tony history. "I saw the show the Monday after the Tony Awards. Moreno won Best Supporting Actress in a Play. You'll note that I said 'Supporting Actress' because that's what the award was called then," recalled Viagas. "On Tony night, Rita [said] she was the leading lady in The Ritz and 'I ain't SUPPORTING nothing but my beads' [noting her costume's beaded necklace]." "So the next night she made her entrance swinging her beads and the house went nutzoid with cheers and applause. She was already giving 'Googie' 110 percent, or so the award would indicate. That night, she gave 150 percent. The next year the category name was changed to Best FEATURED Actress in a Play."